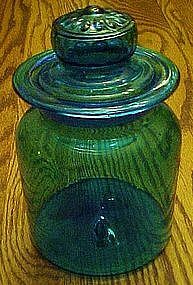 hand blown turquoise cannister, Blenko? This pretty hand blown canister is made of the prettiest aquamarine blue (or maybe turquoise) color. Measures just over 7" tall with lid on. Lid is mold blown and has a center daisy decoration. Ground glass inside jar neck and on the lid neck for an easy fit. This looks like a Blenko piece but I can't be sure. maybe you will know. Excellent condition!